Jon Gruden's return to Oakland has not exactly gone as hoped, but the Raiders coach denied his 1-5 team have already given up on the season. Oakalnd hired their old coach prior to the 2018 NFL season but have managed just a solitary victory so far. 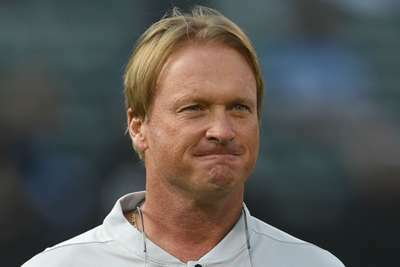 "We aren't tanking anything," Gruden told reporters. "I hear the hatred out there, some of the rumours that we are tanking it to get a first-round pick or a higher pick. We are not getting up at four o'clock in the morning to tank it. Ain't nobody tanking it. "I don't know who wrote that or who said that or who thinks that, but that isn't the case here. We are going to continue to work hard, continue to build our team, and that was part of the message."